What is another word for devastation? 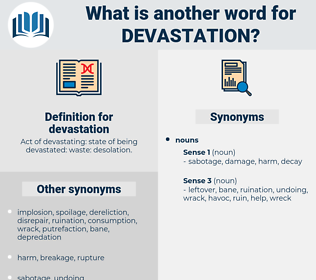 Act of devastating: state of being devastated: waste: desolation. annihilation, demolition, ruination, vandalism, extermination. depopulation, destabilization, depletion, disintegration, toll, Destroying, calamity, despair, erosion, extinction, cataclysm, Shredding, decay, detriment. 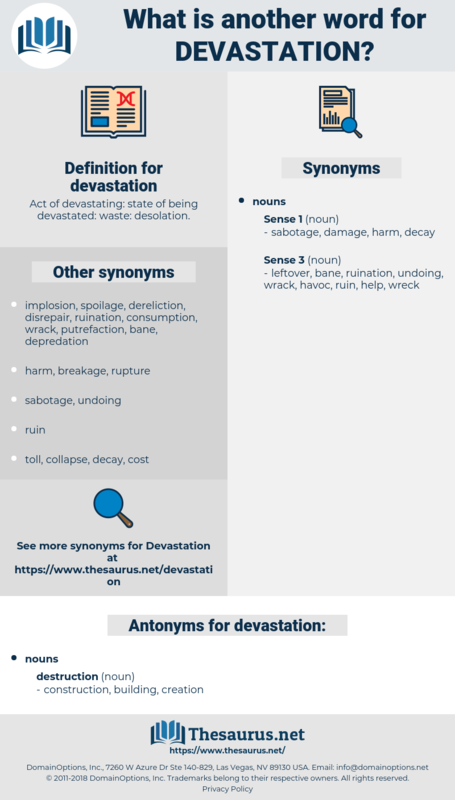 havoc, damage, disaster, degradation, mayhem, catastrophe, disruption, sabotage, collapse, misery, obliteration, harm. Thus the country was a prey to devastation, and the invaders massed round Cyllene. All this devastation results merely in arousing a louder hum in the swarm and is not followed by any hostile demonstration. divagation, deposition, depiction, deification, defection.